Each week, we reviewed the preseason performance of each of the 32 first-round draft picks, so if you’re looking for the grades on those big-named players we’ve got you covered. Here, however, we have an opportunity to champion the preseason performances of some less-heralded players, whether that performance was enough to earn them a roster spot or otherwise. We have simply looked at the highest PFF grades – a production and performance indicator – without allowing strength of competition to muddy the water. A seventh-round selection in this year’s draft, McGough seemingly came out of nowhere this preseason, but his college grades tell a different story. The former FIU product earned a 90.3 overall grade in his senior year with the Panthers, ranking sixth among all FBS quarterbacks with at least 400 dropbacks in 2017. McGough, as his grade above suggests, crushed his first test in the NFL, earning a league-high 89.8 overall grade across 72 preseason dropbacks. He thrived when working from a clean pocket, as he completed 23-of-41 passes for 274 yards and two touchdowns en route to a 90.7 passing grade fro a clean pocket in the preseason. Seattle added McGough to their practice squad shortly after trading for veteran Brett Hundley on August 29. Though he may be ahead of the pack in terms of NFL readiness, McGough should be able to benefit from refining his skillset on the practice squad behind Hundley and starter Russell Wilson. Turner, signed as an undrafted free agent out of Alcorn State, far exceeded minimal expectations in the preseason. The 5-foot-11, 214-pounder averaged a whopping 7.2 yards per carry across 22 preseason attempts, recording six first downs, two runs of 10 yards or more and nine forced missed tackles in the process. Turner was the odd man out in Baltimore’s three-man running back room (Kenneth Dixon, Alex Collins, Javorius Allen), so he will have the year to further acclimate to the speed of the league. Standing at 5-foot-6, 203 pounds, Scott was pushed down draft boards largely because of his small stature coming out of Louisiana Tech, but the Saints’ brass ultimately put an end to his slide in the sixth round of the 2018 NFL Draft – and early returns are exciting. After earning the eighth-ranked overall grade among FBS running backs a year ago (88.0), Scott earned the second-ranked overall grade (73.6) among all qualifying NFL running backs this preseason. He also recorded five forced missed tackles and 139 yards across his 28 preseason touches. With veteran Mark Ingram suspended Weeks 1-4, Scott should play a considerable role in the Saints’ offense behind sophomore phenom Alvin Kamara. Newly-signed veteran Mike Gillislee may also dip into his touch total, but his work to date should allow him to see the field in the regular season. After going undrafted in this year’s draft, the former Alabama wide receiver signed with the Washington Redskins to compete for one of the final wide receiver spots on the roster. Five catches and 131 yards later, Sims stands tall as the sixth and final receiver on the Redskins’ 53-man roster. All five of Sims’ receptions went for first downs and 45 of his 131 receiving yards came after the catch. Smith, a rookie third-rounder out of UCF, earned an 83.7 overall grade with the Knights a year ago, which was good for 18th among FBS wide receivers with 250-plus snaps. Smith has picked up where he left off, earning an 82.5 overall grade and an 81.2 receiving grade across 149 preseason snaps. The 6-foot-2, 210-pounder torched defenses 10-plus yards down the field, catching all five passes on throws with at least 10 air yards thrown in his direction for 94 yards. James Jr. proved lethal after the catch in his NFL preseason debut, as he ranked second among all wideouts in total yards after the catch (108) and averaged a healthy 7.0 YAC per reception on 15 catches. The 49ers’ seventh-round pick caught 15-of-17 targets for 192 yards and one touchdown en route to an impressive 80.7 receiving grade. Though the sample size is limited, Akins excelled when targeted this preseason, catching all four of his targets for 53 yards, two touchdowns and two first downs. Akins will play behind veteran Ryan Griffin as the team’s No. 2 tight end but expect the rising stud to make his presence felt when given the opportunity in 2018. Noteboom was one of two rookie offensive tackles to play north of 20 pass-block snaps and not allow a single pressure during the preseason. With veterans Andrew Whitworth and Rob Havenstein starting as the Los Angeles Rams’ two bookends, Noteboom isn’t expected to play a ton in his rookie campaign, but a strong start for the third-round TCU product isn’t a bad sign for the Rams’ future at the tackle position. Uhatafe performed well both in pass protection and as a run-blocker with the Atlanta Falcons this preseason, earning 73.5 and 74.2 run-block and pass-block grades, respectively. While Uhatafe’s efforts didn’t earn him a spot on the Falcons’ 53-man roster, he shouldn’t be out of work for long given his performance in the team’s four preseason games. Cole earned a respectable 79.4 overall grade while playing offensive tackle for the University of Michigan in 2017, Cole’s versatility from his time in Ann Arbor came in handy when A.Q. Shipley went down with injury. Cole logged 60 total snaps at center and allowed just one pressure on his 30 pass-blocking snaps while also earning a 77.8 run-block grade in three preseason games. Evans earned an impressive 81.0 run-block grade while allowing just two pressures in 70 offensive snaps with the Philadelphia Eagles this preseason. The former UCF product went undrafted and was recently released by the Eagles, but he shouldn’t be overlooked much longer. Leonard wasn’t perfect for the Saints this preseason, as he allowed three total pressures in Weeks 2 and 3 across just 22 pass-block snaps. However, Leonard did make up for that with strong efforts in the run game, earning a 74.4 run-blocking grade across 44 run-blocking snaps. 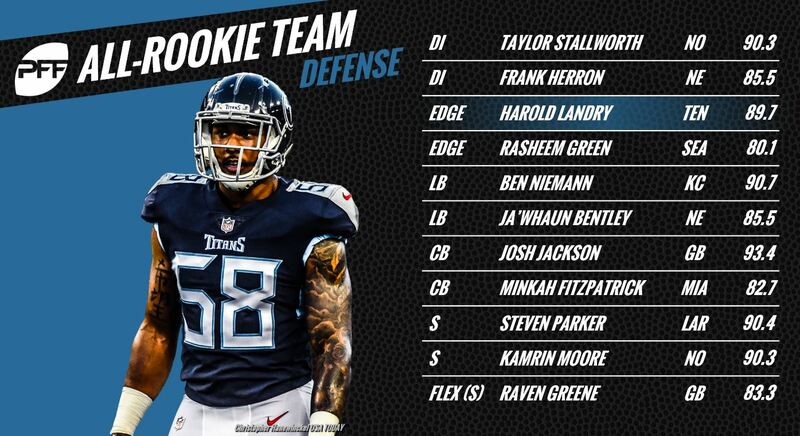 Landry recorded three pressures and two defensive stops across 56 defensive snaps in three preseason games with the Titans, earning an 89.7 overall grade in the process. Now dealing with a high ankle sprain, Landry is questionable for Week 1, but if he does suit up, expect him to be involved in the Titans’ edge rotation early and often. Green, a third-round edge product out of USC, had one of the more consistent preseasons of any NFL defender. Recording at least two pressures in all four games, Green finished the preseason ranked ninth in total pressures (12) and tied for first in defensive stops (nine). In the Saints’ final preseason contest, Stallworth totaled one defensive stop and forced a fumble in just 19 defensive snaps, which combined for a 92.2 overall game grade. He also earned 67.3-plus overall game grades in the three games prior and finished the preseason with four total pressures and four defensive stops. Herron didn’t push himself onto the New England Patriots’ 53-man roster after signing with the team as an undrafted free agent, but his preseason efforts did land him practice squad with the Seahawks. Herron finished the preseason with four total pressures and three defensive stops in addition to an 84.1 run-defense grade. Niemann, an undrafted Iowa product, was all over the field for the Chiefs’ defense in each of their four preseason games, forcing his way onto the team’s 53-man roster. Niemann recorded a whopping 13 tackles and eight defensive stops while missing just two tackles in just 95 defensive snaps in the preseason. He also allowed just three receptions on five targets for merely 18 yards in coverage. Bentley may be bound for an increased role in the team’s defense after a stellar preseason. The former Purdue linebacker excelled in coverage, as he earned the sixth-ranked coverage grade (85.8) among all NFL linebackers with 30-plus coverage snaps in the preseason. Our highest-graded FBS cornerback from a year ago is now the NFL’s highest-graded cornerback in the preseason, as Jackson tops all cornerbacks who logged at least 40 coverage snaps in overall grade (93.4) and coverage grade (93.7) this preseason. Jackson looks every bit as good as his college production would suggest, an early sign that Green Bay came away with one the best second-round picks in the 2018 NFL Draft. Fitzpatrick entered the fold with high expectations given the team’s first-round investment in the former Alabama standout. And so far, expectations have been met. Playing mostly slot cornerback, Fitzpatrick earned an 82.5 coverage grade across 42 coverage snaps, allowing just three receptions on seven targets for 14 yards in the process. Parker turned in a stellar performance in the Rams’ fourth preseason game, as he recorded five tackles, one interception and a 91.5 overall game grade. Largely because of his final efforts, Parker landed on the team’s practice squad. 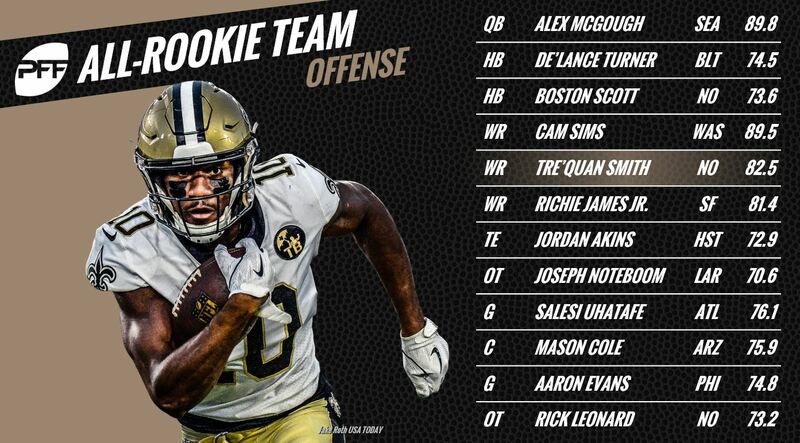 Playing 51 total defensive snaps in the Saints’ final preseason contest, Moore recorded two defensive stops and one forced fumble en route to a 92.3 overall game grade. The New York Giants have since claimed Moore off waivers – well-deserved news for the former Boston College standout coming off a strong preseason. Greene earned 75.8-plus overall grades in each of the team’s final three preseason games. The 5-foot-11, 197-pound James Madison product recorded 13 tackles, seven defensive stops and one forced fumble this preseason. He also allowed just three receptions on five targets for 18 yards. Despite his small-school status, Greene defied odds and earned a spot on the Packers’ 53-man roster.